“Marketing is the activity, set of institutions, and processes for creating, communicating, delivering, and exchanging offerings that have value for customers, clients, partners, and society at large” (American Marketing Association). In the SHSP context, marketing is the process for creating, communicating, delivering, and exchanging information about transportation safety to the public, to safety stakeholders, and to elected officials. Marketing benefits SHSP implementation efforts in several ways: it increases awareness of the SHSP goal to reduce traffic-related fatalities and serious injuries; educates key political leaders on their role in saving lives; and helps address those SHSP elements that require behavior change. Marketing is a necessary component of transportation safety because the reduction of crashes and fatalities depends on attitude and behavior changes in the individuals who use the transportation system, not just modifications to the roadway and surrounding environment. SHSPs address both infrastructure and behavioral emphasis areas, and the techniques and approaches used to connect with road users and modify their behavior, i.e., branding, information dissemination, awareness, etc., can be applied to marketing transportation safety overall. While the SHSP is an important vehicle or process for improving safety, marketing efforts should be focused on education and reducing fatalities and serious injuries. States spent a great deal of time and effort developing SHSPs in hopes of improving safety. Effective marketing can persuade stakeholders, officials, and the public to support the goals of the SHSP and become more involved in its implementation. Facilitating involvement among all stakeholders is important because without active and committed supporters, implementation does not happen. When thinking of stakeholders it is important to consider involving as many individuals and groups as possible. Keeping the SHSP as a purview of a small group of stakeholders defeats another goal of the SHSP which is to change the way engineers, planners, law enforcement, educators, and emergency medical services do business, and persuade them to work collaboratively. Marketing helps stakeholders understand that â€œbusiness as usualâ€� is ineffective and no longer acceptable. Marketing helps safety stakeholders understand the vital role they play in saving lives and why their continued involvement in SHSP implementation is important. Previous chapters noted the difficulty in maintaining interest in the SHSP once it is developed. Marketing is one way to keep interest and activity levels high. People want to be a part of something bigger than themselves; educating stakeholders about life saving programs and activities generates ongoing commitment. It is recommended that States develop and implement a marketing plan. A successful marketing plan should include clear goals and objectives. Listed below are some strategies and dissemination techniques that should be developed as part of a marketing plan. Define the target audience(s) for the marketing effort. Gain support and involvement from new safety stakeholders. Keep current safety stakeholders interested and actively involved in implementation. Educate the public about the SHSP and the Stateâ€™s most serious transportation safety problems. Raise awareness of the SHSP goals and objectives among elected officials. Coordinate media and communications messaging among all the partners involved in the SHSP. Provide opportunities to highlight different aspects of transportation safety. Unique branding that includes a logo and slogan. Paid radio and television advertising. News media events (earned media). New media (e.g., blogs, podcasts, Facebook pages, etc.). Presentations at safety and community meetings. The marketing strategies and dissemination techniques listed above can be organized in many ways. Each of them can be used to reach nearly any audience, but due to their different characteristics, some are better suited to address stakeholders and elected officials while others naturally focus on reaching the general public. Here they are organized according to how well they support the five elements of a safety marketing plan. These elements are 1) educate the public; 2) gain stakeholder support; 3) raise awareness; 4) highlight different aspects of the SHSP; and 5) coordinate media and communications messaging. Establishing a branding strategy is particularly important when attempting to reach the general public. Because efforts to engage the public are broad-based and focus on raising awareness and modifying behavior, it is important to reach as many people as possible. Techniques to support this type of marketing effort include radio and television advertising, public service announcements, blogs, podcasts, news conferences, etc. When attempting to engage stakeholders and elected officials, on the other hand, marketing efforts tend to be â€œoutreachâ€� based and focused on the particular ways a given stakeholder or official can help to improve transportation safety. For example, practitioners may be in a position to implement policy and allocate resources and elected officials have the ability to strengthen laws and appropriate funding. To reach these people requires a marketing approach customized to each stakeholder. Techniques to support this type of marketing effort include meetings, presentations, safety summits, SHSP newsletters, etc. The five marketing elements together with the dissemination techniques best suited to each of them are described below. Educate the public about the SHSP and the State’s most serious transportation safety problems. Branding: Almost anyone in America knows the golden arches represent McDonald’s. Large corporations spend millions of dollars branding their products and their companies so people will recognize and remember them. The same can be true for the SHSP. When members of the public see the SHSP branding, they know the product, activity, or information they see is related to improving transportation safety. For instance, if the State is conducting a traffic safety campaign on impaired driving, such as “Over the Limit, Under Arrest,” the SHSP logo can be included on all print and broadcast materials. Branding usually includes a logo and a slogan. The graphics in Figure 6.1 illustrate branding examples for several State SHSPs. News Events: News media events educate the public and involve safety stakeholders in a stimulating and fun activity. These events are usually centered on a specific issue coordinated with the SHSP emphasis areas. Invite the SHSP champion to attend and participate in the event and distribute brochures and other materials to the news media representatives. Changes in the number of fatalities and serious injuries are a good topic for a news media event centered on the SHSP. Gain support from new safety stakeholders and keep current stakeholders active and involved. Web Sites: Web sites generate interest in safety, particularly if an interactive function allows people to sign up, ask questions, and obtain additional information. Some States post the SHSP on the DOT Web site, while others create a unique site to support the SHSP. Web sites also serve the practical function of allowing emphasis area team members and other stakeholders to gain information on the latest research, review meeting reports, obtain updated data, etc. Newsletters: One way to gain support and keep current stakeholders interested and involved is to let them know how different groups and individuals are implementing the plan. Quarterly newsletters could be sent to stakeholders throughout the State. The newsletter features quick updates on each of the emphasis areas team activities. In addition to the update information, a feature recognizing a stakeholder who stands out as a safety champion could be included. Presentations: States interested in gaining support for the SHSP from new stakeholders can conduct outreach activities. For example, presentations by SHSP champions can be made to the State association of counties or to the State police chiefs association to spread the word about the SHSP. Many States also have State or local engineering chapters that may welcome SHSP presentations at their meetings. The key to effective presentations in these cases is to leave the participants with strategies for getting involved and specific activities to implement. Summits: Safety summits generate enthusiasm. They are used to educate stakeholders on implementation progress, stimulate networking, suggest ideas for best practices, etc. To obtain buy-in and support, however, the best approach is to give participants something to do. This can involve a review of the SHSP to determine what is working and where additional help is needed or organizing participants into regional teams that select the emphasis areas they feel are most pressing and determine what they will do to address them. Raise awareness about the SHSP goals and objectives among elected officials. Brochures: Concise, well-written brochures that outline the purpose of the SHSP and its importance to the State’s residents can be especially effective in educating elected officials. Whenever possible, include information that shows how the SHSP not only saves lives and prevents injury, but also improves the Stateâ€™s financial bottom line. Providing this information to State legislators helps pave the way for legislative changes identified in the SHSP implementation plan. Presentations: Presenting the SHSP to legislators is an effective way to raise their level of awareness. Providing elected officials with a presentation they can use to talk about safety also is helpful. Elected officials are often called upon to address community and business groups. A tailored presentation on transportation safety demonstrates to constituents that officials are well informed and concerned. States may want to conduct symposiums to educate legislators about the Stateâ€™s safety needs and the SHSP. Provide opportunities to highlight different aspects of the SHSP. In many States marketing traffic safety focuses on behavior such as impaired driving (the “Over the Limit, Under Arrest” campaign), safety belt use (the “Click It or Ticket” campaign), etc. ; however, marketing campaigns can effectively address infrastructure issues as well. For instance, a number of infrastructure improvements could be of interest to the news media, which is one of the marketing dissemination tools. In one State installing rumble strips on 1,400 miles of roadway resulted in a 42 percent reduction in the number of vehicles driving off the road. The effort caught the attention of the news media which traveled to one of the rumble strip sites to interview the DOT program coordinator. During the interview, the coordinator highlighted the benefits of the rumble strip program and tied the strategy back to the SHSP. Coordinate media and communication messaging among all the partners involved in the SHSP. A review of the number of agencies and organizations that promote transportation safety messages in any State may reveal a surprising level of activity and interest, (e.g., community groups promoting pedestrian safety for children walking to and from school, the annual “Click It or Ticket” campaign sponsored by the SHSO, etc.). While this level of activity is appreciated, it can create problems particularly when messages compete for the same audience. Rules of marketing include consistency and repetition â€“ tell people what you are going to tell them, tell them, and tell them what you told them. To address the issue of message consistency and repetition, one State formed a Strategic Communications Alliance made up of public information officers and media professionals from government agencies, MPOs, private sector organizations, public relations firms, and community groups. The purpose of the Alliance is to bring together traffic safety communications experts; coordinate messaging; develop a communications calendar that includes the major high-visibility enforcement initiatives; and support implementation of the SHSP. The State believes the group is needed to prevent competing messages from different agencies and coordinate efforts. The Alliance meets quarterly and approves all marketing materials for the SHSP, including the branding and logo, newsletter design and contents, and information for the SHSP Web site. Recently the group developed a traffic safety survey to determine how each agency or organization currently provides or could provide support to existing safety campaigns. Develop a Statewide strategic marketing plan. Address overall transportation safety rather than just the SHSP document. Brand the effort with a unique identity. Gain support from new safety stakeholders. Use newsletters and safety summits to keep stakeholders interested and active. Educate the public and elected officials about the SHSP and safety issues. Provide opportunities to highlight different aspects of the SHSP through news media. Coordinate media and communications messaging among all SHSP partners. Prepare materials to distribute through public relations channels and earned media. Answering these questions will help stakeholders assess their SHSP marketing processes and identify opportunities for improvement. Has your State developed a marketing plan? What groups are targeted in the marketing plan? 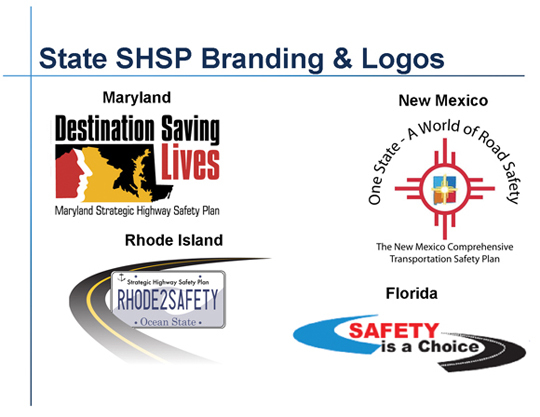 Has your State developed a specific branding for the SHSP? Have marketing and communications materials been developed? Does your State have an SHSP Web site; is the number of hits tracked? What outreach activities have been conducted to gain more interest and support for the SHSP? Has the State held any news media events related to the SHSP? Does your State conduct safety summits?